Share content across sites without resorting to a multi-site install and bundle several exercises up into a feature that can push new content to a live site in one fell swoop. 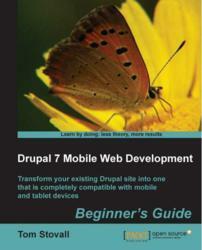 Drupal 7 Mobile Web Development Beginner's Guide: Published! Packt brings to you it's first ever Drupal 7 Mobile Web Development Beginner’s Guide that allows readers to implement audio, video, charting and mapping solutions that work on Mobile, Tablet, and Desktop browsers. Written by Tom Stovall, this one of a kind book will enable the reader to set up Domain Access and Drupal Behaviors that redirect mobile and desktop browsers to the version of the website most appropriate for their client. To make the transition to a mobile site easier, this guide includes a ‘Mom & Pop’ restaurant site along with fun examples of a family pizza restaurant that help the readers adapt their websites to those that are fully functional in a mobile environment. Besides sharing the content across sites without resorting to a multi-site install, readers can customize themes that will present their site with a unified marketing message. Chapter 1: When is a Phone Not a Phone? Drupal is a free and Open Source Content Management System, which is written in PHP and is used as a back-end system for at least 1.5% of all websites worldwide ranging from personal blogs to corporate, political and government sites. It is also used for knowledge management and business collaboration. Independent developers can unleash their creativity by developing mobile-friendly menus using context and image styles to create a customized view for the home page.